EL PASO, TX – El Paso attorney Francisco Ortega has been named a shareholder of ScottHulse PC, a premiere commercial law firm which has served the West Texas, Northern Mexico, and Southern New Mexico Borderplex for 125 years. 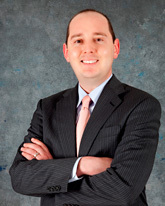 Mr. Ortega’s areas of experience include commercial litigation, appellate law, and labor and employment law. In addition to being a member of the State Bar of Texas, he is admitted to the bars of the U.S. Court of Appeals, Fifth District, and the U.S. District Court for the Western District of Texas. Prior to joining ScottHulse in 2009, Mr. Ortega served as a law clerk to the Honorable David M. Medina of the Supreme Court of Texas and as a law clerk to the Honorable Philip R. Martinez of the U.S. District Court for the Western District of Texas. An El Paso native, Mr. Ortega is a graduate of the Greater El Paso Chamber of Commerce Leadership El Paso, Class 34. He serves on the board of directors of AVANCE and the El Paso Marathon Foundation. He also serves on the Ethics Review Commission for the City of El Paso. Mr. Ortega is a graduate of the University of Texas at El Paso and the University of Wisconsin School of Law.